Conservative Hangout: You Can Help Christians & Gays In The Middle East TODAY - HELP Disrupt ISIS Online! You Can Help Christians & Gays In The Middle East TODAY - HELP Disrupt ISIS Online! Those of you who pay attention to the news know about the atrocities committed by ISIS and other terrorist organizations against Christians, gays, and other Muslims who "aren't Muslim enough" all across the Middle East. Some of you have watched the beheading videos. Others of you simply know that those atrocities have occurred. You most likely are aware of the Christian genocide that is occurring right now, during our lifetime. After the last Jewish holocaust people all over the world said, "never again". But, another genocide is occurring right now. "#NeverAgainIsNow"
I've seen the comments from many people who ask, "Yeah, but what can I do about it?" TODAY, I FOUND AN ANSWER TO THAT QUESTION. I've been reporting ISIS propaganda videos and accounts on YouTube and Twitter for a few months now. But, basically, I've been doing it alone (or so it seemed). Sometimes I could get one or two of my Facebook friends to help report the offending accounts, but not many of them have either Twitter OR YouTube accounts (nor were they willing to open accounts on those platforms - even to help to disrupt ISIS - go figure). NOW, YOU DON'T NEED AN ACCOUNT ON YouTube OR ON Twitter (but, it would certainly help if you had one of each so that you, too, could help report the offenders on the respective websites). After you submit an offending website, or YouTube video, or Twitter, or Facebook, or Google+ account, or any social media account to that website (top, left corner of the website - and, yes, you can report to GhostSec anonymously), they'll investigate and tweet out to their followers the account you submitted where capable people (like you and me) who are willing to help them disrupt ISIS can report the offending accounts to the proper websites. After each account is reported enough times, they'll eventually be removed and/or suspended by the hosting website (YouTube, Twitter, etc.). The point of doing this is to DISRUPT the abilities of ISIS to communicate online via social media. If they can't spread their propaganda, they can't recruit more fighters to the cause. It's that simple. Will this ELIMINATE ISIS? Of course it won't. But, it has the potential to totally screw up their communication with each other and with the outside world. Our government certainly doesn't appear to be working to eliminate the online efforts of ISIS online. I mean, if I can find ISIS videos on YouTube and ISIS accounts on Twitter after searching for all of 2-minutes, it's pretty obvious our government isn't doing a damn thing to take them down, right? It's now time for YOU to get involved. If you could spend even 20 minutes a day...or every other day...it's more than you're probably doing now, right? Now you no longer have to ask, "What can I do to help?". Now you know. This is an ongoing online battle because as soon as one ISIS account gets suspended or terminated either on Twitter or YouTube (or any social media platform), the ISIS user who was banned simply creates another one. It's important to GET AHEAD and STAY AHEAD of them. The quicker these new accounts can be targeted, the LESS LIKELY they are to be able to maintain the communication with their sympathizers or reconnect with other ISIS fighters that is so important to their growth and to their existence. What can I do about ISIS? 1. Go to the GhostSec website and click on the "Our Team" tab to find who to follow on Twitter. 2. Start reporting ISIS accounts. 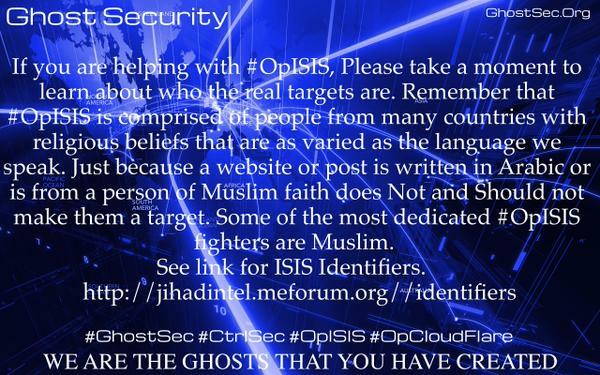 If, for whatever reason, you do not wish to help disrupt ISIS online, you can contribute to the efforts of the GhostSec team by visiting their crowdfunding site HERE. If you can't donate, share this blog post, or share the GhostSec website or share their crowdfunding site (or share it all). Everyone can help spread the word...even if you don't know how to copy and paste, just hit the "share" button at the bottom of this post. Many innocent people 1/2 way around the world would thank you if they could.